Mount Ellinor conditioner to [snow] scramble. 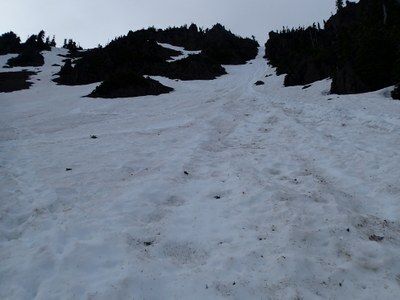 Snow level is midway between summer-winter junction and rock garden, ~1,400 meters / ~4,600 feet. South slope is starting to melt out. Depending on weather, ~2 more weeks and the trail might just be clear of snow. The summit is mostly melted out. Section of trail between summer-winter junction and 2nd viewpoint (where it levels off for a short distance), requires extra care since this is a steep rocky area, slippery when wet. Rock moats in rock garden area. Habituated goats that can get a bit too close. Forest Service recommends throwing rocks at them. Since all participants are current Basic Climbing students, we went up the summer couloir to make it more of a challenge. Though the South slope would be an easier ascent, it's much less of a challenge.